“Culture of Honor” by Danny Silk. Destiny Image Publishers, inc., Shippensburg, PA, 215 pages. 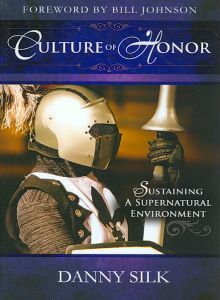 “Culture of Honor” is subtitled, “Sustaining a Supernatural Environment”, everything is great about this book, except the title! It has a picture of a knight on the cover, it speaks of “honor”, but if you think this book is about respecting and honoring others, chivalry or protecting the dignity of the church you’d be wrong, just like me. In fact, “culture of honor” is a kind of buzz word at Bethel Church in Redding, California. Listening to their podcasts, they talk about it quite often. However, reading the book, I think the best title would have been the subtitle, only that wouldn’t sell books. So it is called “Culture of Honor”. After reading the book twice (it is a good book), I still can’t see how they came up with the title. Danny Silk is one of the main pastors at Bethel’s church. From the very beginning the book tells stories and they way that church staff dealt with the stories as being different. I grew up in churches which had very clear and sharp judgments for sin. Some sins get a swift kick, other a permanent kick, others are considered “normal” or “small sins”, and they just get overlooked because everyone is doing them. The response of the Bethel’s leaders to “sin” is interesting. They seek to restore people to their relationship to Christ. Not punish. It sounds simple, but really this book is about “grace”. It could have been called “culture of grace” and been much clearer. The problem with “grace” is that it is a loaded word. When I think of “grace”, I don’t think about forgiveness, hope, honor, or restoration. I think about my own experience with “grace”. Nearly every church I have attended that is named grace is well known for legalism, pride and intense individualism. Try wearing blue jeans, much less shorts and a t-shirt, to a church named “grace” and see how quick you get condemning stares. Mind you, this is my own experience with the word “grace” which colors how I view biblical grace. Biblical grace is nothing like our man-made understandings of grace which is colored by our experience. I think a significant problem that many pastors have is how to “motivate” their people. Nearly every pastor would believe that all Christians are called to service/ministry, but few are successful. To be successful it requires true Biblical grace in releasing and empowering others. This is the “culture of honor” that Silk is speaking of. This is a really good book for leaders; all leaders. It helps us to see how we can adjust our mindset so that we can equip and release people instead of being their judge. We don’t need any judges of people; Jesus will take care of that along with the Holy Spirit pricking their consciences. We do need people who are willing to operate in forgiveness, building up of the body, empowering, releasing, hope and blessing. Do I think a Lutheran, Methodist, Baptist or not “Bethel-ite” leader should read this book? Absolutely. I don’t think anyone should read this book and then use it as a way to criticize their leaders. But any leader can learn a lot from what God is doing and be a better leader, minister and equipper at the same time.